an 11 year-old sixth grader from San Francisco. Spring of 2010 he was beginning his research for a school assignment. Enjoy the results of his research assignment. It was a cold winter evening in Truckee. My family was taking a walk in the downtown. I looked across the street to the historic Central Pacific train station, and wondered about how and why it was created. Who was involved? Why was it built? Then I looked around and observed my other surroundings. There was the Donner Pass Road, filled with cars, pedestrians on the sidewalk, the large historic buildings such as the old hotel with a Charlie Chaplin picture on it, the building that once was a Chinese herb shop... I realized that Truckee must have a fascinating history, and that it would be an interesting experience to learn about it. One day, the "maker of all things" was dividing seeds into piles. Each seed represented a person, and each pile represented a tribe. The "mischievous west wind" decided to blow wind over the seeds to blow them away. The wind blew away most Washoe seeds, and when the maker of all things turned the seeds into people, there were less people in the Washoe tribe than in any other tribe. The Washoe territory extended throughout the Tahoe area. At the center was Lake Tahoe, pronounced "da ow" in the Washoe language. Pine nuts were a big part of Washoe life. They were commonly eaten, and were the main object that the Washoe used to trade for things they didn't have. Washoe also ate rabbits and deer, which were hunted. The Washoe were famous for their beautiful baskets. Even though they had a prosperous society, the Washoe disappeared when white people started settling in the area that is now Truckee. Modern day Truckee started to be developed around 1863 when an Englishman named Gray set up a toll road in what is now Truckee. He decided to make money by charging people who came through the area. The area was named Gray Station after him. Gray was successful until a man named Coburn, who was from Sacramento, decided to do the same thing as Gray, and ended up putting Gray out of business because he was able to provide food and supplies for people that paid the toll. The area was renamed Coburn Station. Eventually, people started settling near Coburn's toll road. Coburn Station was renamed Truckee after a friendly Paiute chief in the area who constantly said "Tro-kay" which meant, "all is well" in the Paiute language. The settlers in Truckee thought he was trying to say his name, and decided to name the area after him. One of the most important milestones in Truckee history was the tragedy of the Donner Party, and how they camped in Truckee. On April 16, 1846, a group of covered wagons left Springfield, Illinois. The group was led by James Reed, an Illinois businessman. Before Reed embarked on the journey, he read a book called "The Emigrants' Guide to Oregon and California" by Lansford W. Hastings. In his book, Hastings advertised a shortcut across the Great Basin. Hastings promised that his shortcut was the easiest way to get to California. Reed decided that Hastings's Cutoff is a great route to use. Unfortunately, Reed didn't know the route had never been tested. Reed received a letter from Hastings saying that he would meet him and lead Reed's party through the cutoff. On July 19, 1846 the party split, a majority taking the safer route instead of Hastings's Cutoff. George Donner was elected leader of the group who chose to take the cutoff. Unfortunately for Donner, Hastings had left with another group, and the Donner Party struggled to catch up. When the Donner Party reached the Weber River, they found a note from Hastings telling them to take another trail through the Wasatch Mountains. Hastings said his route would be safer, and faster. Instead, the Donner Party lost 36 oxen and four wagons, causing them to struggle for 6 days. The Donner Party finally rejoined the California Trail in present day Elko, Nevada. When the emigrants finally reached what is now Truckee, they had almost no food and belongings. Three families managed to reach Donner Lake (in Truckee) by late October, but were unable to go any further due to a very strong storm. The families buil cabins to survive the winter. By December the families were running out of food. Ten men and five women, later known as Forlorn Hope, made snowshoes and set out for Sutter's Fort (100 miles away). The Forlorn Hope reached Sutter's Fort on January 18, 1847. There were two men and five women left. 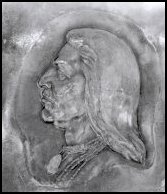 Four rescue parties, called reliefs, were created to save the Donner Party. The four reliefs arrived in February and March. The emigrants at the camps were starving, and eventually had to resort to cannibalism to survive because the reliefs couldn't take all of the emigrants at once. Of the 87 members of the Donner Party, 48 survived and 39 perished. 81 were trapped in the mountains near Donner Lake, which is where most emigrants died. A big part of Truckee's history was that there was a Central Pacific train station built in Coburn Station (now Truckee). In the mid 1800s a man named Theodore Judah dreamed of making a railroad across the Sierra Nevada. The thought of building a railroad through the Sierra Nevada was considered absurd at the time, but four men named Leland Stanford, Collis P. Huntington, Mark Hopkins, and Charles Crocker (later called the "big four") agreed with Judah. The "big four" created a company called Central Pacific. Crocker became the head of construction. The labor teams were mostly Chinese slaves. 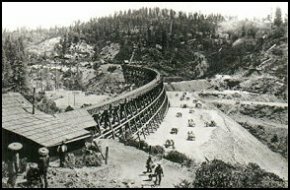 Eventually, there were many Chinese people in Truckee that were working on the railroad. Nobody wanted to be near the Chinese, so they were only allowed to live away from the Coburn Station. They built several Chinatowns, which were frequently burned down. There are still a few Chinese buildings left in Truckee such as the Herb Shop from the third Chinatown. In about six years, the project was completed, and Judah's dream came true. In 1959, the Central Pacific formally merged into Southern Pacific. Southern Pacific was bought by Union Pacific in 1996. Another big part of Truckee history was the lumber mill in Truckee, and the ice mine in Boca (in Truckee). The first lumber mill was built in 1867 by Joseph Gray and George Schaffer near the Truckee River. Another lumber mill was built by Elle Ellen along the Trout Creek (in Truckee) in 1868. Ellen's mill burned down in 1869, but was rebuilt. Many other lumber mills existed to supply the Central Pacific. The Lumber industry was a big business in Truckee. The ice mine was started in Boca. Ice became very popular quickly, because many people wanted ice (refrigerators weren't invented yet). Ice was usually shipped to San Francisco by train. Since there was a lot of sawdust from the lumber mill, sawdust was used to pack the ice. Today Truckee is a small town located in Nevada County, California. It has a population of 13,864 people (2000 Census), and takes up 33.8 square miles. The railroad is still in Truckee, but it is owned by Amtrak. Many historic buildings are still in Truckee, particularly in the downtown area. The lumber mill built by Elle Ellen is now owned by the Truckee-Tahoe Lumber Company. Truckee is a beautiful town, and I would strongly encourage readers of this article to visit it. Some content contained within this article came from the historical archives of the Truckee Donner Historical Society. For more information about our archives and artifacts email history@truckeehistory.org.